If there had been more distance between him and it, roughly the same stretch of space between inspiration and poetics, writing the story might have been simpler. But, be that as it may, with that part of the journey ongoing, Van Moon had some time ago scribbled an undone sentence (three tenses, a sophistry, are, were, will be…) which, he freely admitted to himself, could not fully be conceived as part of the nebulous whole that existed in his brain, or if it would eventually join some other work, another story, or novel, or perhaps an unrhymed poem—finished or otherwise. He placed down his pen, a retractable roller ball that dispensed bold, wet lines of black gel, onto his notepad parallel to its blue lines then pinched his creased glabella. Van Moon, who signed his name in two letters so that the V disappeared into the diagonal strokes of the M, rose, hesitated—he saw the story’s valedictory sentence perch itself on a thought’s ledge, but not leap—and walked away from his desk. The notepad was, in fact, a legal pad, with a quarter of its yellow pages tucked behind its cardboard back. 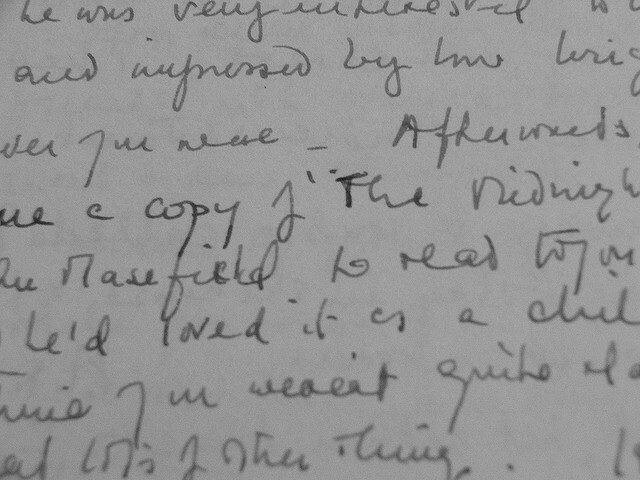 Not each of those furled pages contained a record of his unfinished letter, however. Some were covered with unrelated doodles; others with bits of works more complete than his letter. But as a matter of record, a recording of a man’s mind and habit, a perceptive person could easily trace the journey to its beginning along the path of unhardened footprints. As cathartic matters he held other creations dearer; as works of art he held others even dearer, but none had combined heart and art in this manner before. He returned to his desk—beneath his final step a floorboard screamed—leaned forward and wrote almost illegibly, A stronger man would—, then expunged “stronger” with a straight black line; for a moment “better” filled the void, jotted above the excised word, but was similarly crossed out. I wish this letter were unnecessary, he thought, then scribbled the line triumphantly. I wish this letter were unnecessary, he rethought, and continued, as much as I wish regret hadn’t compelled me to write you; but these are twin, mutually dependent truths, and I can negate their veracity as easily as I can move heaven and earth, which I would do if doing so would…What I must say has been rehearsed and rehashed and replayed in my head countlessly. There it is complete. A final leg I have to bear it…My handwriting is legible, hopefully: if it isn’t, I will rewrite the letter, word for word, automatically, so that each sentiment is unchanged. Not the heart, or the soul, rather the little spark beneath your navel is your truest north. I now rely on it unreservedly. Why a letter? If something cannot be said, it can, with near certainty, be written. Libraries teem with emotions that were too intimate to speak. Hatreds, petty jealousies, long-recalled slights, and what were called unrequited loves, though nowadays there may not be a name for it that isn’t an acronymic disorder. Some states of being, against all self-flagellation, cannot be uttered and remain unsaid. Volcanoes erupt, people consider. Humans are luckless in this regard. But there are cases, too, when a verbal shelter is not enough and one grasps for another layer. Here is the deception, the artifice without which there is no art. Van, after overmuch consideration, conceded to himself that he would never send the letter. Even though he craved to do so; even though he ordered himself to do so; even though he could see it being read and starting a pleasing chain of inevitabilities in some definite point in the future, he would not do so. It would be tucked away—folded perpendicularly and placed in a never used dictionary—where its warning light would go dim then dark…unless, unless there was another way. A short story, an epistolary one in which the details would be chosen and presented so particularly she, and only she, would recognize herself; to capture its obsolete mood, he’d write its first draft longhand. It was, he knew at conception, his greatest idea. And a beautiful, audacious idea it was, fitting his talent and her worthiness. Imitation is the sincerest form of flattery, he thought, a muse must have coined the phrase. An artist can express himself sufficiently one way. Non-artistic modes are imprecise and leave undercurrents unmentioned. As the saying goes, I began with a problem and ended with a plea like an old love song. More than that, a letter is a perfect anachronism, one which allows you to read my thoughts as well as see the state of mind with which I wrote them—my hurried, hunchbacked Fs; the way my letters lean rightward, nearly parallel to the paper’s lines, when I’m writing excitedly; the ovalet of black ink where I paused, reflected. Letters arrive singly, each in his own vehicle, self-contained and untainted by the one read before it. Choosing to open it is a commitment to its contents. Emails are bars of pale glow organized by time of arrival; labeled with just a name, skimmed and deleted summarily. This purpose deserves better than to travel with a crowd of coupons and trifles. He sat, easily guiding himself onto the taut cushion of a cobalt office chair. His desk, filched from an alleyway, had been the middle section of a winged kitchen table. On its rectangular top was a laptop, shut and nudged to his left side, a pocketsize notebook on the twentieth page of which he had written “billet doux,” and a pump bottle of lotion. Van rolled the pen between his lips, which tasted like the aloe vera cream he was squirting into the palm of his hand. As is lotion’s wont, little was much, and it spread past his wrists, up his forearms, and was enough for an elbow. Beneath his fingertips the final traces were disappearing, where he had similarly rubbed a bump and bruise. A patch of ice and a carefree step, he would now take the bus. A still warm seat next to a man who dozed off when they moved and awoke with a lurch into Van’s healthy arm when they stopped. He massaged his elbow with soft, circular motions; she swore she would never ride the bus again. There was the smell of wintry sweat, she recalled, the type that seeps from beneath overcoats and sweaters. A child, who could have sat in his mother’s lap, instead had the final seat, and she stood with her hand clutching the rail above her head between a man with bushy, uncombed hair and another in a suit. After a single stop, the suited man casually turned toward her and as casually introduced himself, supplely erect, to her hip. The worst part, she said: having to maneuver by him to the door. And sometimes I can see us clearly, cinematically sitting in a pink train car with blue cushions, possibility in every corner. Your eyes are closed to not see the evening’s demon-like shadows. A tiny kiss scratches your cheek, and like a spider softly traverses your neck. You bend your head and whisper to me “find it, find it,” and we patiently search for it because it travels a lot. There are instances, too, when I mistakenly believe to have seen you. Crossing an intersection with his arm circling your waist: Thankfully it was not her, I thought, but had it been, they would not last. It could not be otherwise. Hope whimpers loudly! ; pushing chubby, toothless, sleeping twins in a two-tyke stroller, which had caused me to sweat with fear and envy; or snatching a weed from the driveway of a house with rust-colored siding. She does not resemble you in any way, as a matter of fact. She is what you are not—shapeless as an empty pillow case with a tinge of idiocy in her eyes—but sometimes I walk by that house regardless, wanting to feel the electricity of false hope. She looked away as he laughed, a jugular snicker that then billowed from his mouth, as though his reaction was a detail in her story: then Van laughed. This isn’t funny, she said, turning toward him. I know. I know it isn’t, he said, but you have to admit and she turned her head away once more. What he retained from that conversation, however, was not her turning away. That was a simple reflex, a response to a reaction, a detail in his story. Van harbored an invention. In retrospect, he had imbued their exchange and her little gesture with trepidation which had not existed then. She looked away a little disappointed he had not disappointed her expectations, and he could now see her never turning back. An auspice overlooked; the regretful are always psychics in reverse. A flashlight portended a death, a clogged toilet predicted a divorce, and she diminished against a vaporous skyline. From the present’s limitations, moreover, without the ability to see any part of the here and now as a sign, he viewed his past self with unfamiliarity. This person was unconnected to the current man. He was a copy playing a character, a strange and perplexing one who looked and spoke as him but did not act as he would. Various things might have changed the shape of time, the contemporary Van knew; the regretful are also revisionists. Taking her hand may have molded a sphere, an embrace made its area solely for two. The actor saw her to the door that opened to a staircase to her third-floor walkup. I really liked the story you read, she said, even if I had to get harassed to hear it. An iota of pink lint from her scarf was in her hair. The actor’s arm flinched infinitesimally to remove it, but his hand never left his side…I’m glad you liked it, he said, and that you were able to come: then Van apologized. I committed a false start, I realize, and have said some things too soon. Cruel irony. Sense and sentences are arriving haphazardly, not in the order they were assigned like kindergarteners in lunch line. Rather they are rushing forward like kids at Christmas. My preface was supposed to be an admission I am irreligious and have never experienced before, and therefore lack a means to rightly explain the unmitigated emotion I feel, which can only be truly comprehended through a divinity which tells us we are not piteous specks in an empty universe. A secular vocabulary is insufficient. Existence’s magnitude, its supernovas and bumblebees, cannot be defined by the words that delineate it. You’ve heard a morning chorus and felt the inadequacy of calling it chirping. So, if this letter means anything to you, know it cannot mean everything I want it to. like the past as possibility. and what will we make of our assembly? in the reimagined past called dreams. Shaun Rouser (MAPH ’11) was born and raised in Memphis, Tennessee. © 2012 Colloquium. All images are copyrighted by their respective authors.